Topics: Puppies For Sale, Happy Owners, Puppies Available, and Guardian Families. Its 2 nameservers are ns45.domaincontrol.com, and ns46.domaincontrol.com. It is hosted by Godaddy.com Inc (Arizona, Scottsdale,) using Apache web server. 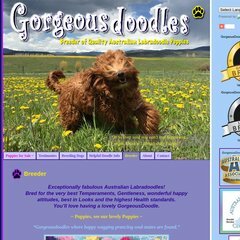 A-labradoodle.com's IP address is 64.202.189.170.